Looking to get into shape for your big day? 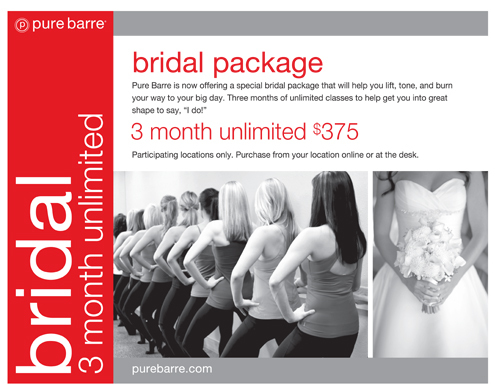 The ladies at Pure Barre Whitefish Bay are offering a 3-month bridal special. The package includes three months of unlimited classes to help you lift, tone and burn your way to your big day. The offer is exclusive for brides-to-be, and currently there is no expiration date for the offer. Simply purchase online or at the front desk. The philosophy at Pure Barre is that fitness should be fun. The instructors believe that everyone is capable of rocking their classes – no dance experience required. For more information on the Whitefish Bay location, what to wear to your first class, and more visit the Pure Barre website.